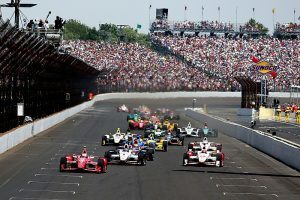 American motor racing, famous for left turns around high speed oval race tracks, doesn’t get more famous than the Indianapolis 500. The Indy 500 is so called because the race is contested over a distance of 500 miles, or 200 laps. The race is steeped in history for a number of reasons. Firstly, it’s held annually at the oldest race track in the USA, going all the way back to the first race in 1911. Secondly, it features one of the strangest customs in all of motor racing — the winner drinks milk to celebrate their victory. This custom hails back to 1933, when Louis Meyer asked for a glass of buttermilk after his second victory. A few years later, after winning the race for the third time, he asked for a glass of buttermilk again, but was given a bottle instead. This was captured by a photographer, and a local dairy company saw a marketing opportunity. Unaware that Meyer was actually drinking buttermilk, the company offered future winners a bottle of milk. Apart from a period from 1947 to 1955, milk has been presented to the winners every year. In addition to milk, the winner receives a big bulky ring to commemorate their victory. The race concludes a week of festivities. In contrast to other races that are a part of the Indycar Championship, there is a week of practise sessions preceding the race. This gives even rookies a chance at winning. Given the fierce competition, the race is witnessed by a large crowd that fills the 250,000 seats to capacity, and even overflows to extra viewing areas on the infield section. Following the liberalisation of social issues in the 1970s, a number of female drivers have competed at the event. Sarah Fisher started the event a record nine times, and Danica Patrick boasts the highest finish among female participants at third place.